Tired of feeling like you can't have anything nice in your home because your kids will destroy it? 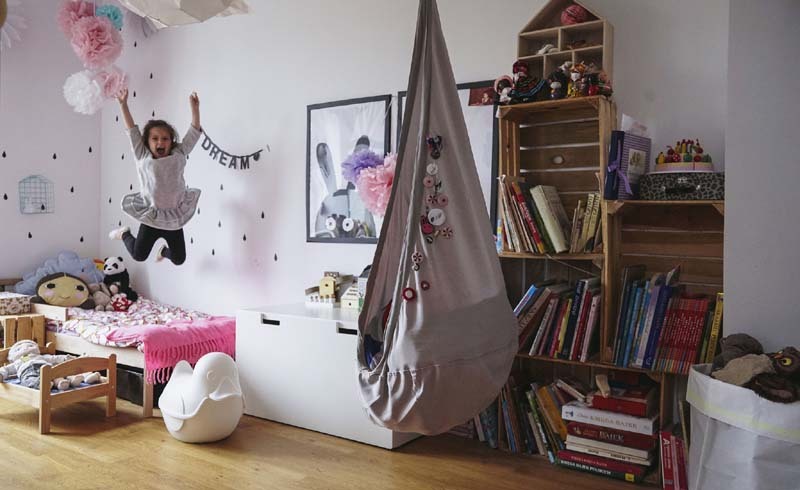 Don't despair: It's possible to have a well-designed house and happy kids, says DesignMom.com's Gabrielle Stanley Blair. The mom of six and author of the new book "Design Mom: How to Live With Kids: A Room-by-Room Guide" is sharing her secrets so you can start living in the beautiful home you and your family deserve. "My house is full of beautiful furniture, but none of it is precious," says Blair, who lives with her husband and six kids, ranging in age from 5 to 17, in Oakland, Calif. "I have some pieces that look that they would be really difficult to clean, but I got them in a kid-friendly material. There really are options, and as you go out and start shopping, the more you look around, the more you realize, 'Oh, this fantastic, industrial side table would be great with kids. It's already been in an office for 30 years, and if it withstood that, it can withstand my kids.'" Instead of getting stuck in the thinking that your home design can't be beautiful and functional for your family, think about how your spaces could work the way you want or need them to. "Look for where your home is frustrating to you, and if there's a way to re-adapt things, just go for it," Blair says. "The nice thing about homes these days, and the way people are approaching designing them, is that the rules have kind of gone out the window. If you want to do a girl and boy in a bedroom, that's fine. 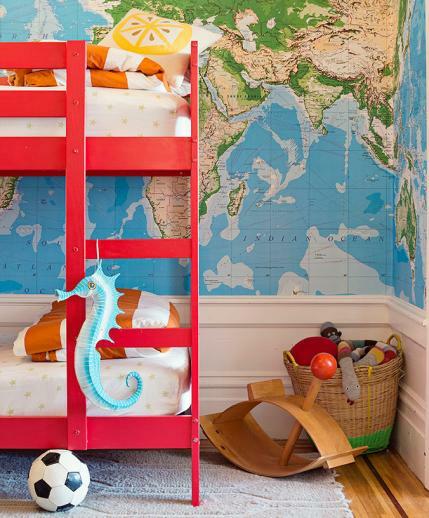 You want to do a playroom/bedroom? Totally cool. You want to get rid of your dining room? Do an art room, that's fine. If you want to make your family room more like a movie theater, there you go. It's really up to you." Of course, you do have to make practical decisions, Blair says, and that's what her new book is all about. "There shouldn't be anything in your house that's making you yell at your kids, or causing it to be a trigger where you're getting frustrated," Blair says. "There shouldn't be anything in your house that you value more than your relationship with your kids. Whatever it is, if you feel like it's a frustrating point in your family, there are solutions that are good looking and that you'll like." Check out these eight ideas from Blair to get you started on the path to living in a gorgeous home while raising your kids. 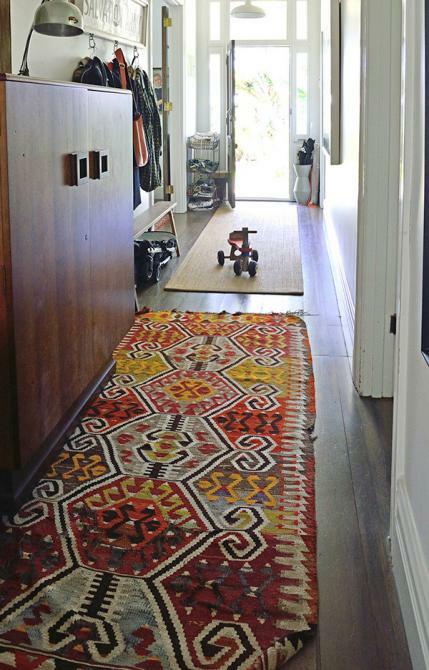 Little sneakers can get pretty dirty, so having the right entryway rug is important to stop the crud from migrating too far inside—plus, it's the first thing you see as you come in and the last thing you see as you leave. "If the first thing you see is a stained rug, it's just depressing," Blair says. "And you don't want your last thought to be, 'Not only am I late, but I have one more thing to add to my to-do list: Get that rug cleaned." Instead, choose an easy care rug that hides everyday dirt, Blair advises. Wool rugs repel moisture, respond favorably to cleaning, and hide soil wonderfully when woven in dark colors or complex patterns. Or, consider a woven vinyl rug. It is durable, mold and mildew resistant, and easy to clean. You can shake the lightweight rug out on the front porch, or scrub it outside with a hose and dish soap. Blair says families could also keep a stack of washable cotton rugs at the ready by the door for extra dirty sneakers or wet boots. Homes in rainy climates may want to keep them rolled in a pretty basket within easy reach while those in drier climates could store them in a nearby closet or storage cubby for the occasional grab. 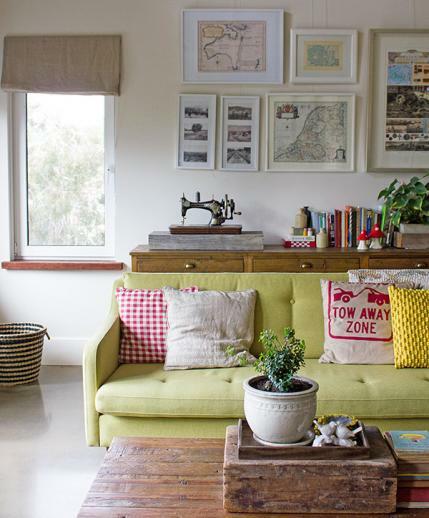 Choosing the right material for a couch will stop you from cringing every time one of your kids launches themselves onto it with grass-stained knees and sticky fingers. Blair loves leather because it can be wiped down and cleaned up easily. "If you go with a natural-looking leather, it will age gracefully, embracing scratches and faded patches like a pedigree," she says. If leather isn't your style or you hate thigh-stickage in the summer, microfiber is water-repellant and soft next to your skin, and can be excellent at resisting fading, staining, and wear. "There's different qualities to microfiber, and some are more stain resistant than others," Blair says. "It's less a function of having to make a design decision and more of a function of asking the right questions at the furniture store." She suggests finding a store salesperson who is knowledgeable about the product or even calling the manufacturing facility to find out which is the easiest care and offers the most natural stain resistance or stain treatment options. As the mom of six kids, Blair knows a "no toys" rule in the living room is no fun and impractical. 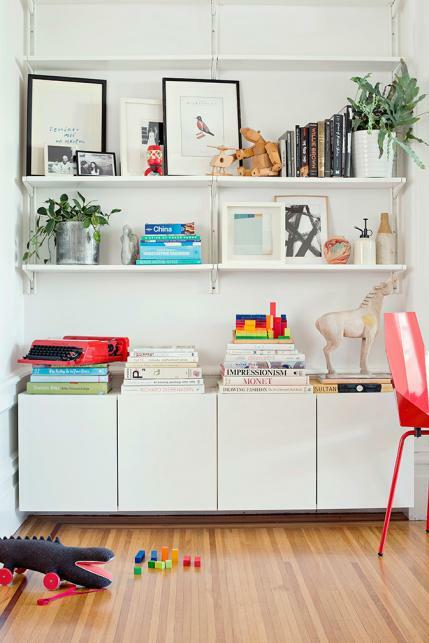 Instead, she says to choose a few of the best-looking ones to add to bookshelves or a side table. You're looking for nonplastic, sophisticated toys, such as a basket of wood blocks, a box of magnetized marbles, a tin of classic dominoes, pretty children's books to mix in with the coffee table books, or anything you could buy at a museum gift shop. Hanging from the ceiling in Blair's living room, for example, is a wooden crane whose wings go up and down when you pull a string. "I bought it in Prague as mobile to go over my sister's baby's crib, but she gave it back to me after using it for many years because she knew how much I loved it," she says. "It's one of the first things people see as they come in, and we've hung it at a height where it's just reachable for a little kid to jump up and grab the little string and pull it." Of course, adults enjoy it, too. "In the average American homes, space is a premium," Blair says, "and to have a room that really only gets use at dinner time, and maybe then only when you're not eating at the kitchen table, just seems like a waste of space." Instead, convert it into space that works for what you really need, whether that be an art project room, a library or something else. "I suggest a library [with floor-to-ceiling bookcases] because people collect books, they pile up, and they have no place to put them," she says. "It can still have plenty of room in the center for a small table with removable leaves for reading or studying on a daily basis. On special occasions when you need a bigger table, put in the table leaves, round up the seating, and you're ready to host." Whether you stick with a formal dining room or eat breakfast, lunch, and dinner in the kitchen, being practical about the table you gather around is a must. "When I'm picking a kitchen table, it's not like I'm even looking at the super high-gloss options that are going to require me to polish them every day, that's not going to be realistic," Blair says. "I'm looking for kitchen tables that already look a little beat up, that have wear and tear to them. Maybe they were actually in a farm house, or they're made of barn-wood or metal." Look for tables that start out with scrapes, dings, and stains, so that when you add your own, you feel like you're adding to the patina instead of sighing over the latest scratch. Plus, think of all the reminders you'll have of family moments. "On our big project table, which used to be our dining table, you can just sort of see the history of projects from my kids," Blair says. "You can can see the faint outline of a giant blue rectangle that was my 10 year old making the Tardis from 'Dr. Who,' or I'll see some glitter that we haven't quite been able to get off from the birthday party when everyone was making glitter crowns." Everyone knows it's nice to walk into a bedroom and see a made bed. "It makes the whole room looks like it's clean even if it's not, so parents really like their kids to make the bed," Blair says. "I get that, but it's really hard for little kids to make a bed. The bed is five times their size!" 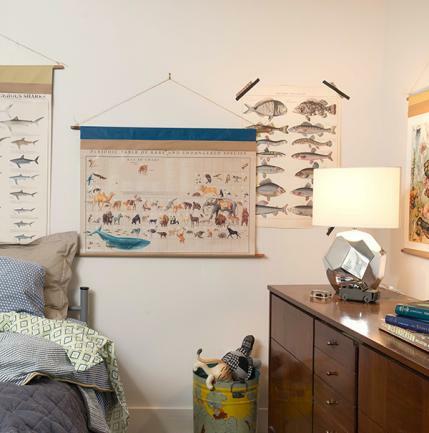 You—and your kids—might love the look of a complicated bed with lots of sheets, pillows, shams, and stuffed animals, but unless you're willing to help them make it every morning, it's not realistic, Blair says. Instead, skip the top sheet and all the layers so children can make their beds by simply pulling up a duvet cover with a comforter insert. When you wash the fitted sheet, throw the duvet cover in as well. "It's the trend in every hotel all over Europe, so it's totally acceptable," Blair says. "Bunk beds are impossible for even adults to make," Blair adds. "It's like gymnastics just to make it happen." Instead, fold up the blanket at the end of the bed, or toss all the bedding in a basket and pull it out at night, whatever your kids can do and keep neat on their own. Blair is quite strict about keeping pop culture paraphernalia out of her house. "I actually am a big fan of Disney, but I've drawn the line at characters," Blair says. "I don't feel like it's worth investing in or that I want to make it a permanent part of my home. And my kids are very likely going to care about a new character in six months." Instead, Blair suggests working your child's love of the latest animated character into their room's decor in more sophisticated ways. "When your son falls in love with 'Finding Nemo,' encourage sea-life exploration with good-looking scientific charts about sharks," she says. "When your daughter's eyes light up at the sight of Buzz Lightyear, print NASA's photos of space as oversize posters, make papier-mache models of planets, and embroider constellations on a throw pillow for her bed. It's 100 percent possible to make a room your child will love without involving Olaf the Snowman bedding." If your preschooler really wants something with a certain branded theme, get something that is disposable. "Get an Elsa balloon, because that's going to die at the end of the day and then we're done," Blair suggests. "Or maybe a box of Mickey Mouse Band-Aids, which I happen to know we have it in our cupboard right now. If they're desperate for characters, there are other ways to work it in." 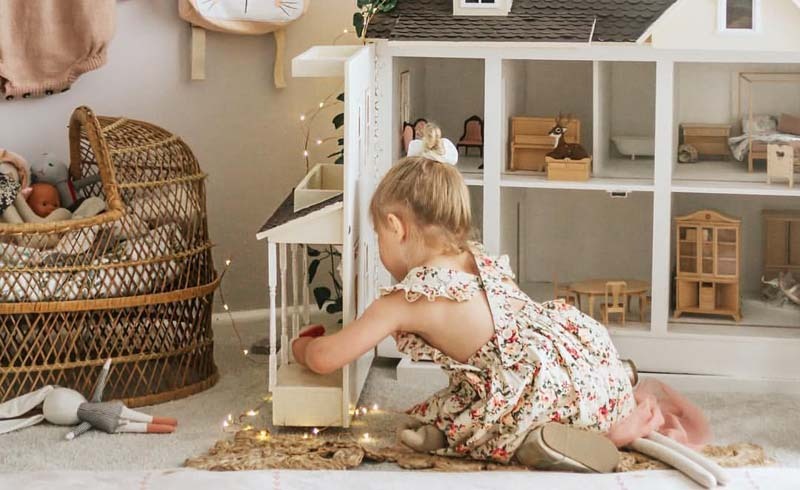 Corralling your child's tiny treasures, or what to you looks like flotsam and jetsam scattered over every surface in their room, can be a major challenge, but some cute hideaway containers are all you need, Blair says. If Junior's collection is something good-looking, like seashells or marbles, a see-through container might be in order. "Your old peanut butter jars that you've washed the labels off of are great," she says. "You can paint the lid if you care, or even sand the peanut butter print off the lid, and then it just looks like a cool, industrial jar." If their collection is less than attractive (where do they find these things?! ), find an opaque storage option. "To hide things, look for [containers] in real, natural materials, like wood, leather, paper or cloth materials," Blair says. This could be a cupboard nightstand, tin lunch boxes, old cigar boxes, or empty stationery boxes. "Start with whatever you already have in the house," Blair says. "If you don't quite have the right thing, then you say, 'well, let's put it in a shoebox that we decoupage or cover with contact paper until we find the right one.' And it's something you can hunt for together, next time you're out shopping." "You can track down vintages suitcases at Goodwill or from Etsy shops," Blair suggests. "Or visit a child's gift shop to find good-looking cardboard suitcases, which come in different colors and patterns and have some stitching around the edges." Other options are linen-covered or sleek cardboard boxes, found at a home store or photography supply store, or keep your eyes peeled at garage sales and flea markets for pretty boxes.